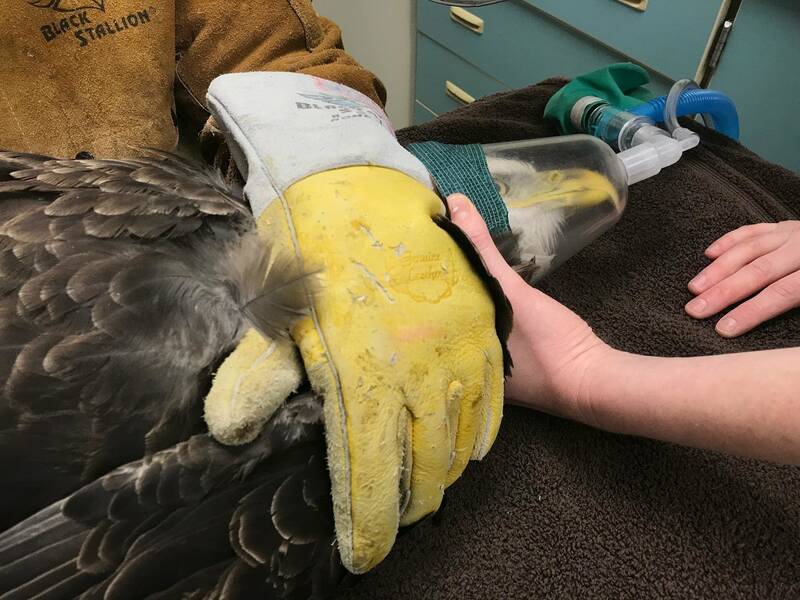 University of Minnesota Raptor Center workers euthanized a lead-poisoned eagle Thursday afternoon, the second this season. The bird came in from a rehab center in Duluth, showing classic signs of lead toxicity. Its eyes were twitching, its breathing was abnormal and it was making soft vocalizations. Staff did a full physical exam of the eagle and drew its blood. "The blood lead level came out higher than our screening tests can record, which is a definite sign of lead toxicity," said Julia Ponder, the Raptor Center executive director. The Raptor Center sees cases like this annually beginning with the deer hunting season. Hunters' lead bullets are the main cause. Those who use lead ammunition shoot an animal and the lead scatters throughout its body. Then, birds like eagles scavenge on the carcass. They want a free meal, but wind up eating lead too. No amount of lead is normal in an animal's body and it can make them sick. Lead toxicity destroys birds' neurological system — "it looks like Swiss cheese in the brain," Ponder said. Sometimes, the lead-poisoned birds are vocalizing loudly and seizing when they arrive at the Raptor Center. On Thursday, the victim was more subdued, mostly quiet with mild tremors. "This bird was very very depressed," Ponder said. And it was too sick to save. So far this season, the Raptor Center has seen two sick eagles where lead was the primary problem, Ponder said. Both had to be euthanized. Five more eagles were admitted where lead was a secondary problem. There's a simple solution to the annual bird killings: Hunters switching to non-lead ammo. "This is not about anti-hunting at all," Ponder said, noting copper ammo as an alternative. "We firmly believe that a bullet shouldn't kill twice."